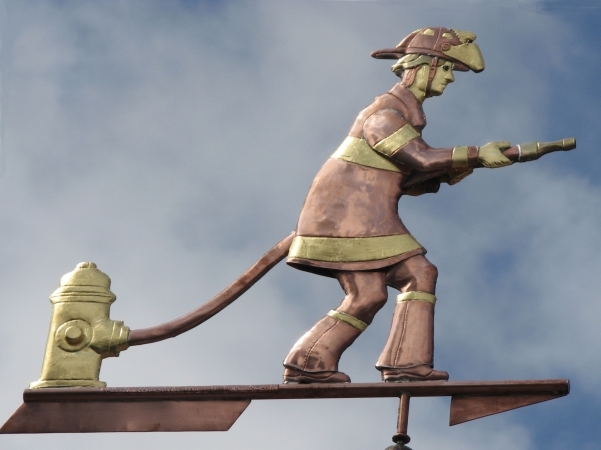 This Fireman Weather Vane was originally commissioned by a proud couple whose son had just graduated from Firefighter’s School. 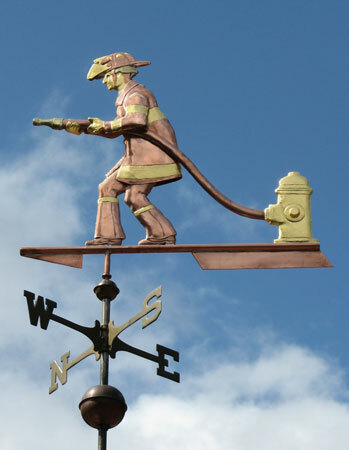 They sent us a photo of him and we literally turned it into a portrait weathervane of their son as a fireman! 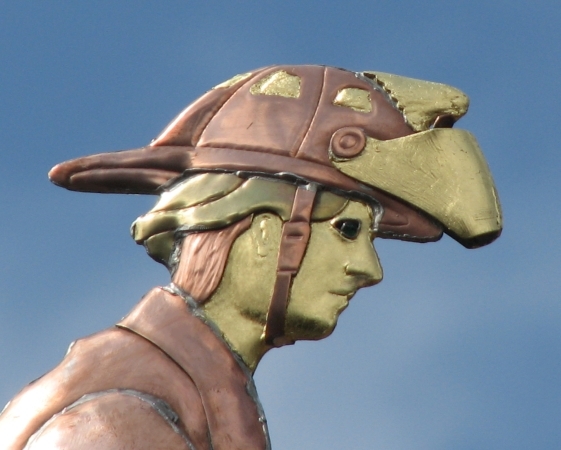 The sculpture piece was further customized with translucent green eyes and an eagle crest (his fire fighting team’s mascot) on the top of his helmet. 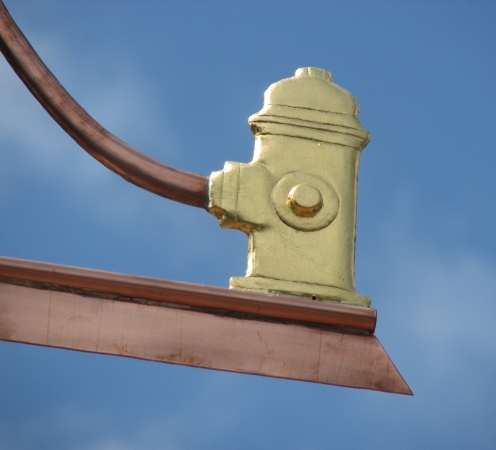 While this weathervane can be made entirely in copper, for this commission they chose the optional gold leaf to add a nice contrast to the primary copper. The contrast is even more spectacular as the vane weathers; it helps clearly define facial features and other design details that might otherwise be less visible, especially from a distance. For added personalization we engraved the name of the fire company for whom he works and we placed a ‘lucky’ penny inside, from the year he was born. 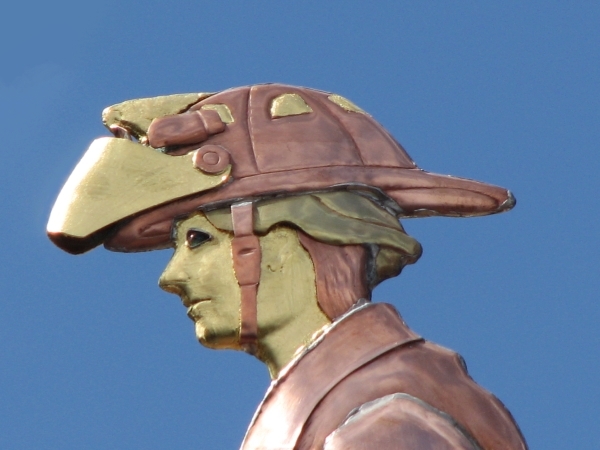 This is a variation on an old Victorian ‘lucky’ penny weather vane tradition, which was to include a penny from the year the weather vane was made inside the sculpture piece. In addition to the Fire Fighter Weather Vane, the couple also ordered one of our American Flag Weather Vanes. One weathervane was mounted atop their home on a new cupola and the other weathervane was displayed on a cupola above their garage. People driving by can tell at a glance what is important to their household. Their proud display follows a centuries old tradition of crafting weathervanes to represent the owner’s focus and/or profession, be it shipbuilding, cattle ranching, a heraldic coat of arms weathervane or even, tracing its history back to the ninth century, a church that displays a weathercock, the ancient symbol for St. Peter, the Rock of the Church. 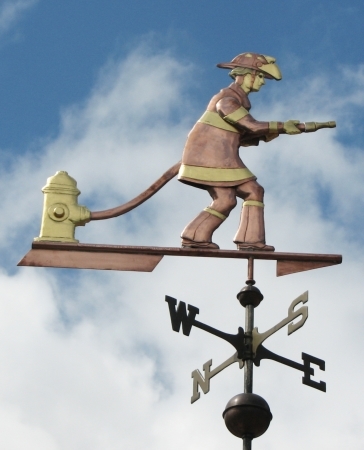 Another wonderful pairing would be a Firefighter Weather Vane and a Dalmatian Dog Weather Vane. We have yet to do such a combination, but I sincerely hope it is only a matter of time before we do.